Instead of idly waiting for visitors to stumble over their holdings on some lonely information by-way, archives are starting to push their content out into the bustling metropolis of the social web. They are going where the people are. Photographic collections, in particular, are gaining new lives and new audiences thanks to Flickr. But that’s only part of the story. Released into the wild, these photos are slowly picking up the habits of the locals. They are making friends, building connections, even speaking with new accents and dialects. Commented, tagged, organised, linked – they are building new contexts for themselves outside of the cloying control of archival descriptive systems. Unfortunately it seems there is often a chasm between the old lives of the photos, documented in databases and finding aids, and their new post-institutional careers. This is a pity because the new contexts they are gathering can help us both understand and find them. What can we do to overcome this divide? How could finding aids harvest and display the user-generated content that aggregates around collection items living in the outside world? 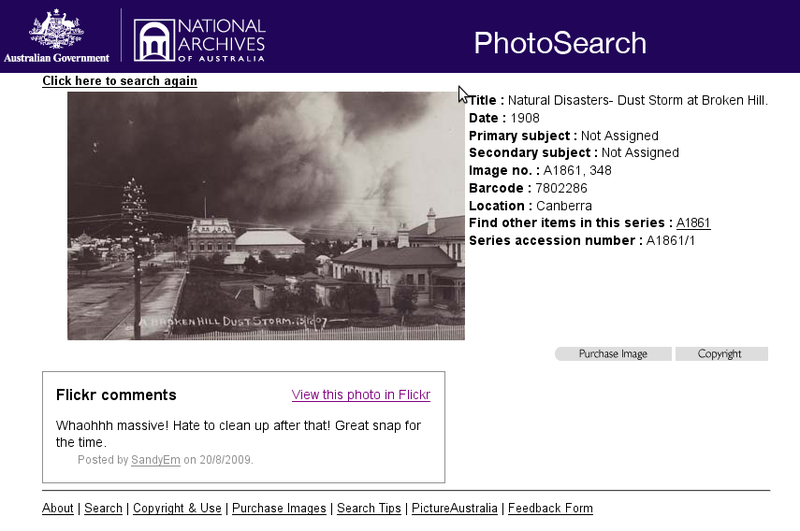 National Archives of Australia Photosearch – try it! State Records NSW Photo Investigator – try it! National Archives and Records Administration ARC – try it! Easy! Obviously for the script to work there needed to be a way of connecting entries in the database with photos on Flickr. In practice this means that the photos need to be described at item level, and that a unique identifier needs to be used somewhere in the description of the photo both on Flickr and in the collection database. From there it’s just a matter of building the calls to the API using Greasemonkey’s built-in GM_xmlhttpRequest method. Once the comments are retrieved, they’re given some basic formatting and inserted at the point in the DOM identified by the siteDetails.position property. Once again, JQuery greatly simplifies all the DOM manipulation. If there are no comments then a suitable message is inserted together with a link to the photo in Flickr. Finally some CSS is added to prettify it all a little bit. You can view the full code on the Userscripts site. Of course, it would be good to have this sort of stuff happening on the server side. In fact, with a few small modifications, this script could just be dropped into the code of any of the collection databases I’ve used. But in the meantime, Greasemonkey gives us a chance to play around with some of the possibilities – to start thinking about what finding aids might be like. If you have any suggestions for databases to add to this script – let me know! Hello, this sounds great and I would like to try it, however the technical details are a bit beyond me. Can you give me a hint? 4. navigated to the web page, added to Greasemonkey as included page. Not working. What do I do now? Andrew, if you have Greasemonkey installed, then all you have to do is go to the userscript page – http://userscripts.org/scripts/show/56135 – and click on ‘Install’. On the other had the second example has produced a modern Google Street view of the historic building in the photo, and a link to a story about an alleged haunting in that building, so there is some useful metadata there. There is much giddyness about the Flickr partnership with various archives but until the Flickr software allows comments and annotations to be rated for usefulness, there is always going to be more wheat than chaff in the comments.